BOTTOM LINE: With todays August employment report showing a nonfarm payroll gain of 96,000 and an unemployment rate of 8.1% because of a drop in the participation rate, we expect a return to unsterilized and probably open-ended asset purchases at the September 12-13 FOMC meeting. 1. We now anticipate that the FOMC will announce a return to unsterilized asset purchases (QE3), mainly agency mortgage-backed securities but potentially including Treasury securities, at its September 12-13 FOMC meeting. We previously forecasted QE3 in December or early 2013. We continue to expect a lengthening of the FOMCs forward guidance for the first hike in the funds rate from late 2014 to mid-2015 or beyond. bleed ‘em till they get better! print money until the economy improves! 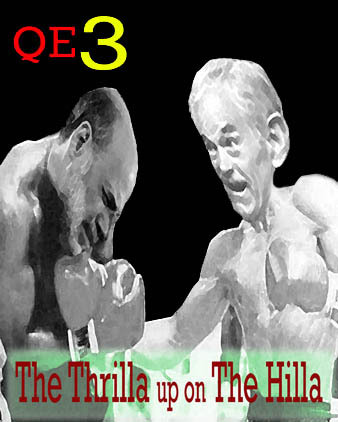 I urge President Romney to nominate Dallas Fed President Richard Fisher (Inflation Hawk) as head of the Federal Reserve. Between Obama spending money to “stimulate” the economy and Bernanke printing it like it is going out of style, they have created a hyper artificial economy that that is divorced from any semblance of reality. They refuse to attack the systemic problems but rather kick the can down the road, make things worse and pray they are not sitting in the chair when hyper inflation and credit defaults set in. Ding Ding Ding. Get ready to rummmmmmble! If “ - - - print money until the economy improves - - - “ is not counterfeiting, then what is? It’s ALL counterfeit. It only has value because the federal government has the power to enforce that it has value. You have succinctly summed up the essence of it. Well done. This is what Reuters has put out for June, July revisions. Why isn't it a story this happens every month? The report's weak tenor was also underscored by revisions to June and July data to show 41,000 fewer jobs created than previously reported. 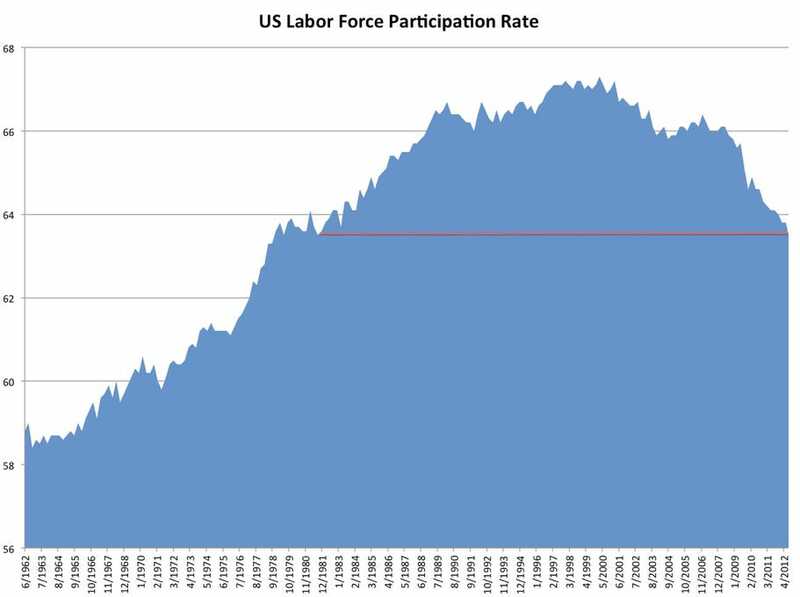 The labor force participation rate, or the precentage of Americans who either have a job or are looking for one, fell to 63.5 percent -- the lowest since September 1981. 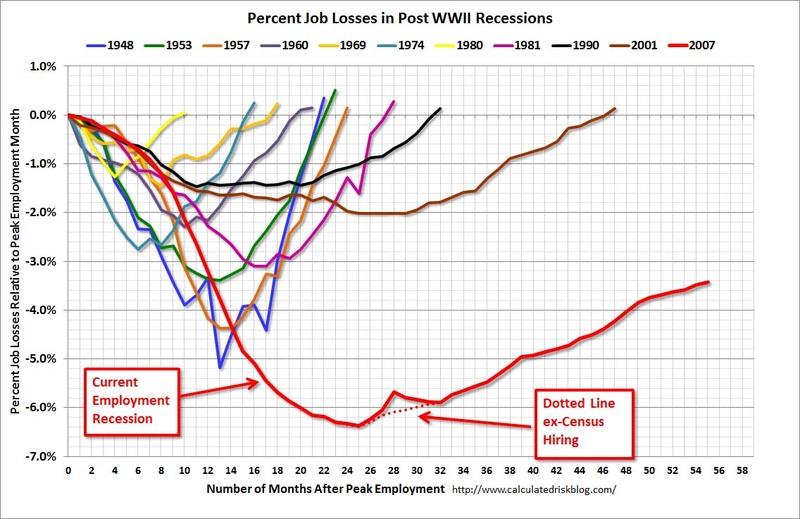 And the Wall St. hustlers are cheering the fact that a pathetic 96,000 jobs were created last month and July was revised down to a truly horrible 46,000....not even 1,,000 per state! These dependents of the Fed know that Ben, the Bartender, will be serving another round of Fed borrowing booze soon, so they can feed their habit of playing the rigged stock market backed by taxpayer money. Make money, it’s mine. Lose money, it’s yours. What a rotten system. Give the addict another hit. Not so. The “value” is only in the minds of those who choose to buy our Federal Government Bonds. However, you may have a point if the Federal Government continues to Nationalize Industries for its own account. And if 50% plus one person decides that it’s all conterfeit the whole house of cards comes down. I know I ma not the only one on here who knows people who are near retirement age and have lost their jobs and now are just trying to get by on what they have till age 65. People are going back to school after being laid off, but of course the MSM will of course again cheer at 8.1 and not tell their sheep the real reason why it is down. If anyone is on FB which I ma not anymore then expect to see people spouting off how great 8.1 is to teir pals but never telling them the real reason why.